It’s been ages since I’ve had Kulfi and had almost forgotten how delicious this very popular Indian ice cream is. The first time I tasted Kulfi was in Mumbai many years ago and I remember at the time thinking… this has to be one of the most delicious ice creams on the planet. Also, I am sure it was made the traditional way, by cooking milk for hours over low heat until reduced before freezing. 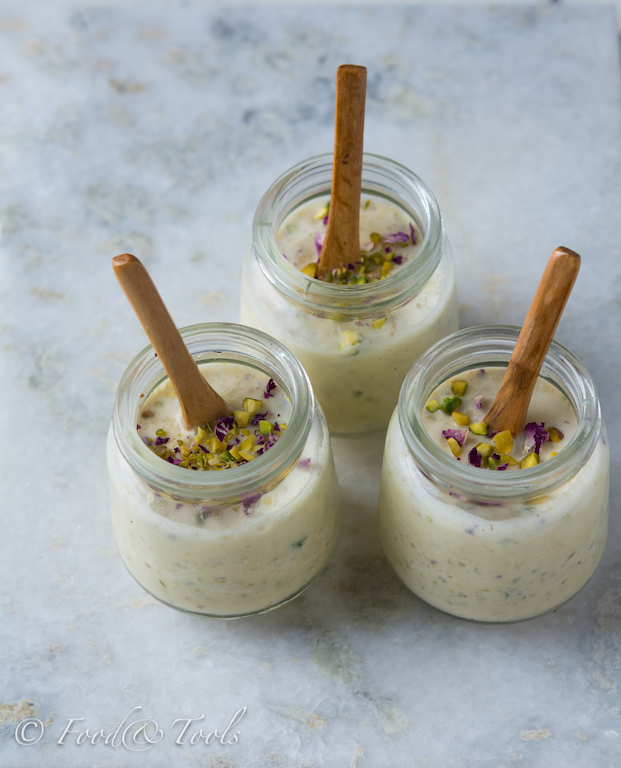 I have to credit Narise Kamber for this lovely recipe and showing us how to make an easier version of her Pistachio Kulfi. Narise (owner of Jenna Bakery and Saffron Cafe) was demonstrating recipes for Ramadan at our local Words Bookstore and Cafe. This Kufli recipe takes minutes to prepare, but like other ice creams, needs time in the freezer before serving, so I always like prepare mine the day before. Although you do not need an ice cream machine when making Kulfi, I had planned to speed up the freezing process using my ice cream machine (which I prefer using), but unfortunately the motor stopped working and now it looks like I need a new one. I had most of the ingredients in my kitchen except the almond essence and cans of cream, I replaced these with vanilla bean paste and fresh whipping cream. I also varied some of the quantities of the ingredients, so have adapted the recipe. 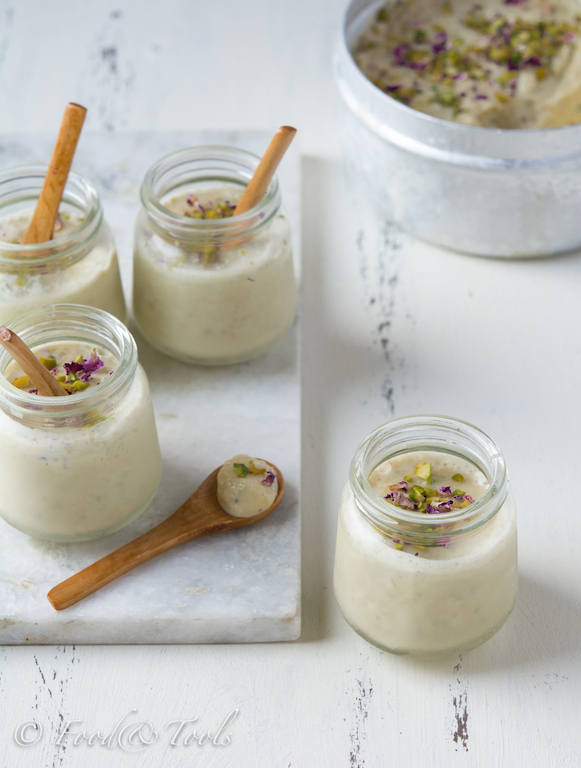 As it’s the holy month of Ramadan, this refreshing summer dessert is perfect for serving after Iftar. 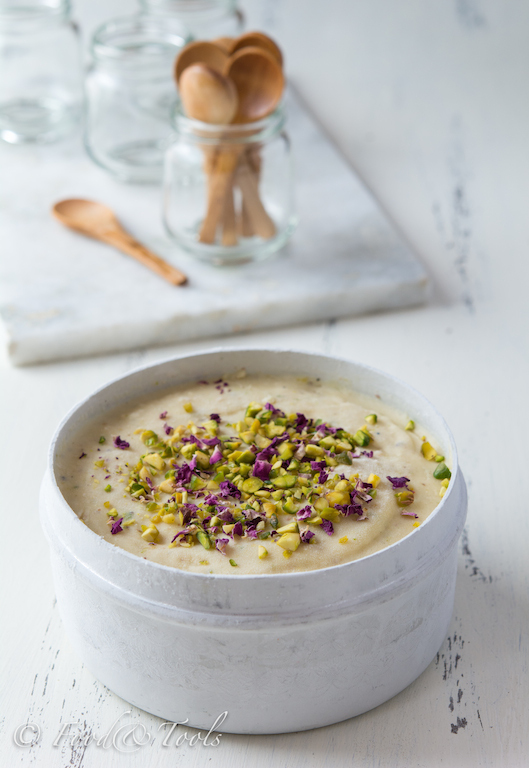 Serve the Pistachio Kulfi from one large container or prepare individual portions when freezing, this way you wont have melting ice cream hanging around while serving your guests. Pour the whipping cream, evaporated milk, condensed milk and rose-water into a wide and shallow (freezes quicker) freezer-proof serving dish. Add the cardamom, saffron, ground pistachios, breadcrumbs and vanilla bean paste. Mix all the ingredients together with a whisk and chill the mixture for about 30 minutes before placing into the freezer. Or, pour the chilled mixture into small individual glass jars or dishes before freezing. Freeze the ice cream for about 4 to 6 hours or overnight. Once the ice cream has frozen garnish with pistachios and rose petals. About 20 to 30 minutes before serving, remove the pistachio kulfi from the freezer and transfer to the fridge to soften. Note: After about an hour in the freezer stir the Kulfi, to distribute the nuts evenly as some may settle on the bottom of the container. I like to repeat this process a second time. Wow that sure is easy. Sounds great too. I hope I remember this recipe next summer. That’s how my mom makes it too! Stunning photos as always Moya! Thanks for this recipe Moya! After I went to Mumbai I tasted the most amazing Kulfi ice cream. Definitely want to give this ago.. The photos are divine.